The quilt that will be raffled this year at our annual Gala fundraiser on April 11 was handmade by Sharon Mathews Wood and Carolyn Burga, with the help of Mona Jones, owner of Sew This! Quilting Shop. 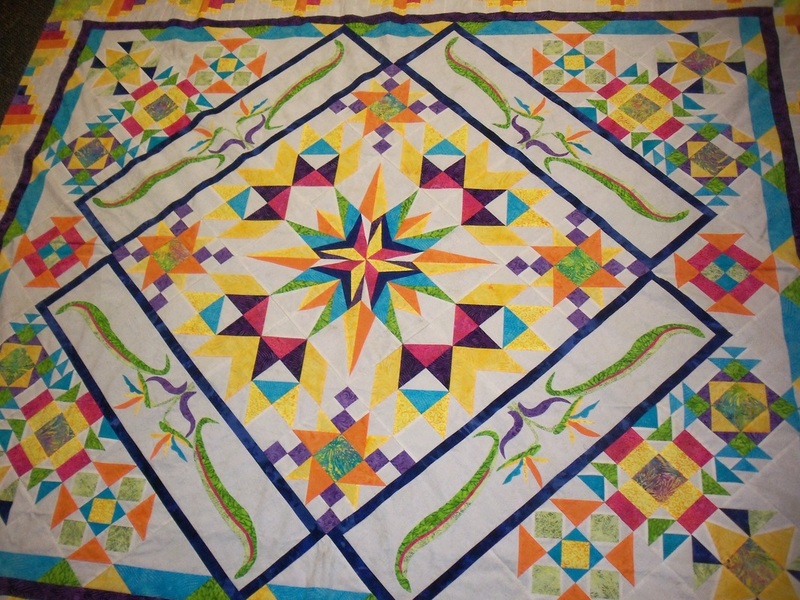 They completed this beautiful quilt as a labor of love – all volunteer – and all donated! The quilt is now on display in the Great Room at the Center! Sharon and Carolyn pieced and appliqueéd the quilt top in Bird of Paradise design and colors of green, blue, orange and yellow. The quilt backing is tone-on-tone white. This work of fabric art is quilted with a “vine and leaf” pattern. The quilt is double bed-sized, made of 100% cotton. Sharon Mathews Wood, local quilter and retired English teacher, has been sewing since childhood. She uses patterns, but also creates her own work from patterns she sees in nature. “The most important factor for me in creating a quilt is choice of colors,” said Sharon. She is a member of the Ozone Layers quilting group and also sews with the Hosanna Lutheran quilt ministry. Sharon will showcase her quilts in a gallery exhibit later this year at the Women’s Center. Carolyn Burga is a fiber artist and works in several mediums – spinning, weaving, quilting and knitting. A graduate of Newcomb College in New Orleans, Carolyn worked as a teacher and librarian. She lends her skills to the Hosanna Lutheran quilt ministry regularly. Mona Jones, owner of Sew This! Quilting Shop, donated the use of her Gamill long-arm quilting machine and donated the batting (the inside fluff of the quilt). Mona has provided ongoing support to the Women's Center by donating fabrics for many of our other projects over the past two years. Last year her business, Sew This! was a Silver Sponsor for our annual fundraising Gala. Many thanks to these three ladies for the time, effort, and energy they placed lovingly into this quilt! Watch the slide show about the making of the quilt!